The below is an interview by Teenaz Javat who interviewed Dastur Khurshed, the Vada Dasturji of Udvada. This appeared in the FEZANA Journal December 2010. With a warm hug in a ranch-style house in the leafy neighbourhood of Mineola, Mississauga. I met an old friend and we got talking. It was as if the 25 years since we last met just seem to evaporate. I was thrilled to bits as I met Ervad Khurshed K. Dastoor, now Vada Dasturji (High Priest) of the Iranshah Atashbehram in Udvada. No soppiness and no telling how the years had flown, he now sports a white beard and I have 20 extra pounds on my 5 foot 2 inch frame. We got talking almost immediately as I had 45 minutes to spend with him and his wife Havovi. Growing up in Mumbai, India, most of my summer holidays were spent in Udvada at my nam’s house. He spent most of his time in Udvada, being the son of a father who occupied the position of Head Priest. So over the years we cultivated a bond- the strength of which was evident in the sharp questions I posed and the no-nonsense answers he provided. A commerce graduate from Mumbai University’s Hasaram Rijumal College, Ervad Khurshed. 47, was ordained as Head Priest by Udvada Samast and Athornan Anjuman on January 27 2002 after the demise of his late father Dasturji Kaikobad Dastoor. Dasturji Khurshed Dastoor joined the Dadar Athornan Madressa in 1971 and became Navar/Martab in Udvada in 1975-76. A father of three (they have 2 daughters Parinaz and Shanaya and 1 son Daraius) he divides his time equally between his liturgical duties in Udvada and his personal life in Mumbai. Here are excerpts from the interview that took place on May 28, 2010 in Mississauga. Ontario when Dasturji Khurshed was visiting the Greater Toronto Area. Teenaz Javat (TJ): Why is there so much of bad blood flowing within our community viz-a-viz the debate over inter-community marriages? Do you even get the sense of how divided a community we have become? straight once and for all. 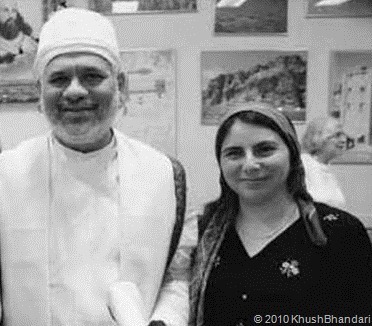 Our religion is based on gender equality and if a Parsi/lram girl or boy chooses to marry outside of our faith and does so by way of a civil ceremony he/she has, according to me, every right to continue to attend the Agiary or Atashbehram of their choosing. initiated into. I do not see any reason why they should not be allowed to offer prayers at any and all places of worship. TJ: There are so many petitions floating around the internet both for and against conversion, what do you have to say about them? DK; The internet has to an extent created a false sense of runaway knowledge Not everything can or must be believed as the information is in most cases one-sided. I do keep abreast of all that is going on, but am not inclined to participate in the controversy that such exchanges generate. To be honest, it is a waste of time. I have other greater and more meaningful responsibilities to shoulder and internet petitions hold the least of my interest or my worries. TJ: But as a head priest of our most pious and sacred atashbehram you do not have an option to stay quiet anymore and the buck to an extent does stop at your doorstep? peace and balance within our small community. Take for instance the case of Ervads Khushroo Madon and Faramroz Mirza. There is one petition that is calling for them to be defrocked and another to be reinstated. I have seen both and signed neither. I am of the school of thought that once you are ordained as a Navar or Martab no one can defrock you as you have been ordained In the house of God. Besides that there are many priests who have like Ervads Madan and Mirza performed navjotes/lagans of children of mixed parentage and other irreligious activities yet nobody is talking about them. DK: It all boils down to financial clout propagating religion of convenience. Just take a look at the amount of money WAPIZ – which is at the forefront of obnoxious movements within the community – spends on advertising in Free Press Journal and circulates them free of charge. Because everyone cannot match their scale of funding does it mean that the defenders of the religion are those with ample money to burn? Certainly not! There are bigger and better things to be achieved to improve and strengthen our community than participate in such a bitter and nonsensical feud. TJ: Bigger and better things like what? Do you have a pet project you are working on? DK: Yes, in fact that is what I spoke about at the Zoroastnan Society of Ontario after performing the jashan on Zarthosht-no-diso. My pet project is to declare Udvada a heritage village – the reason being to stop the construction of high nse buildings that have been spnnging over the village and to preserve the heritage grade status of the Parsi homes and mansions at Udvada . The local infrastructure cannot cope up in providing the required amenities, resulting in inconvenience to the locals and most importantly pose a threat to our Iranshah. These high rise buildings once constructed need to be serviced with huge quantities of water, electricity etc and with 60% of the local population depending on wells for water both for drinking and otherwise, we need to preserve our source of water. The village was built up in a way that one well was meant to service one home not multiple flats that have come up in place of that home. Secondly, the sewage of these buildings is by way of septic tanks. Some of them are so close to the Iranshah that any contamination of the well within the prescient of Iranshah will be disastrous. All our higher liturgies like yazashne. vendidad, nirangdin depend on pure water from our own well and would come to a gnnding halt if the Iranshah wells were to be contaminated. Once the heritage label is applied to Udvada, there will be tangible benefits accruing to the village. The sale and subsequent demolition of heritage grade homes and mansions will be stopped, construction of high-rise apartment buildings will not be allowed and the pristine glory of Udvada as global religious headquarters will be preserved and maintained. Also notification as a heritage village/site will encourage the government to improve the basic town planning infrastructure such as roads, drainage etc. It will also help save our beach. The gravel and sand depletion which has taken place, thanks in part to the construction boom, has left our beach barren and rock-strewn. The pristine glory of Udvada along with the sanctity of Iranshah must be preserved at all cost for the generations to come. Udvada cannot be allowed to degenerate into a location where heritage is replaced by modernity. TJ: At what stage is this project at? DK: Presently nowhere, thanks to those from the community who shout from the rooftops proclaiming themselves to be defenders of the faith. The proposal to car/e out Udvada as a Hentage site was opposed by them resulting in thus far the Government of Gujarat not considering the hentage proposal put up to them in 2004-2005. These same self-defenders of our faith have acquired the heritage status for Agiaries and Atashbehrams in Mumbai, which quite frankly I find ridiculous. TJ: Have you approached the UNESCO? DK: No. I do not want the UNESCO involved as then for every structural change to the Iranshah we will have to get approval from them. Let me set the record straight – we are not doing this due to any lack of funds. Iranshah is truly blessed by philanthropist who at a moments notice clamour to serve and fund any renovations that we may require. My purpose in spearheading this heritage project was to make sure the village does not get run over by runaway development which current infrastructure cannot support. The quaintness of Udvada as you and I remember so fondly must stay as that is what we have to preserve in addition to the Iranshah ever since it was sanctified in 1742. Teenaz Javat is a journalist living in Mississauga. Ontario She works for the Canadian Broadcasting Corporate (CBC). teaches journalism at Sheridan College. Oakville and freelances for newspapers and magazines in Canada and abroad.